Update: Check out Hijab Style on Vogue.com and my brief write up of the event! 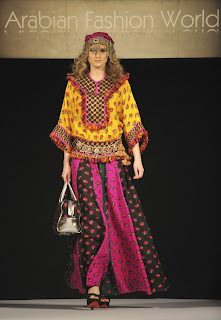 Last night I attended Arabian Fashion World, which I've posted about several times already! The event was fantastic, and it was such a good opportunity to see the designs I blog about first-hand. My favourite of the night was, of course, Rabia Z. I had taken so many photos but for some reason they seem to have disappeared off my camera! 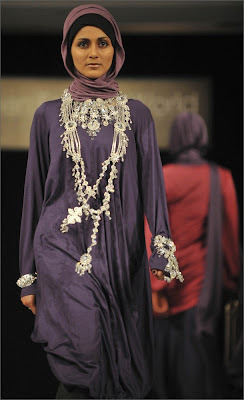 These ones really don't do her collection justice - it was honestly some of the most creative hijab fashion I've seen. And if like me, you're eager to get your hands on some of her designs; the good news is that Rabia hopes to stock her collection at UK department stores. What's more is that one of her lines, Ruby, will be especially designed for the affordable price range (think H&M). By the way u look so cute in that pic...mashaAllah. Awesome! RabiaZ Rocks, no doubt..I just love the different style of hijab wraps potrayed in your pics. Simple yet stylish and elegant, especially RabiaZ hijab wrap looks so perfect and beauitful. I am sure you had a great time at the show! wow, congrats on the vogue piece!